If you count up how many dorm electronics you'll be bringing to college, you might be surprised just how many will be needed and useful. There's your laptop for college, your cellphone, computer speakers, mp3 players and even dorm desk lamps. If any of those college items are going to be useful, you'll need to keep the electricity flowing to them. And to do that, you'll need enough outlets. 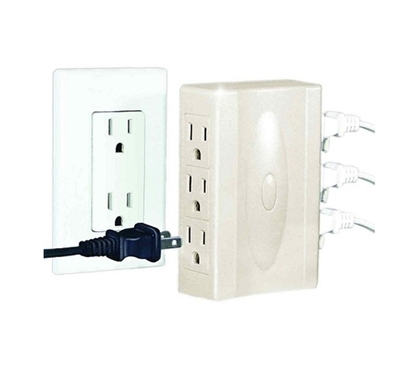 Two outlets just won't cut it, so turn those two into six with this Multi-Plug Outlet. Outlet multipliers are essential dorm room supplies, even if they're not the most exciting dorm items. Just think about trying to make it through college without your college laptop and your trusted cellphone. Without enough places to power these college life necessities, you'll be out of luck! So don't arrive to college unprepared or thinking that that extra-long battery life claim on your laptop will keep it going all semester. Be prepared and add this Multi-Plug Outlet to that dorm shopping list. It's one dorm item you'll use 24/7.